Genuine Skoda Smart Holder - hook. Hang your bag or coat on this handy hook. An ingenious little piece of kit – a hook for hanging up a bag, or even a little shopping. The hook‘s design is very discreet, meaning it will not look out of place in any vehicle interior. 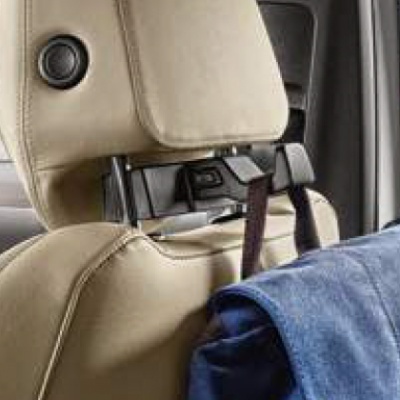 Attaching the hook is easy – simply secure it in the Smart holder (3V0061128) on the front headrest. Thanks to its clever design, it is very easy to remove. The safety and functional parameters of the headrest are in no way affected by the use of the hook. The hook is designed to hold a handbag or a shopping bag that weighs no more than 3 kg. To fit this product, you must also use the Smart holder - 3V0061128.